High-horsepower/high-speed boating is here and steering systems must perform at maximum capacity. The SeaStar Hydraulic Steering System is designed to provide that extra margin of muscle when needed and easily handles Outboard, Sterndrive and Inboard engines in boats up to 50 feet. System selection, installation and service is substantially simplified with just three major components – helm, cylinder and tube or hose. 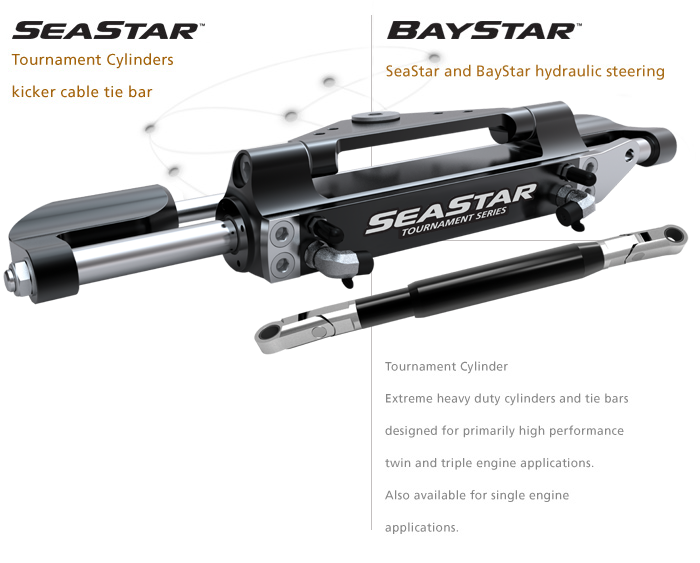 SeaStar has a comprehensive range of available cylinders to handle a variety of Outboard, Sterndrive and Inboard steering applications. These are suitable for both pleasure and commercial applications. Extra steering stations and/or autopilots are easily added. Proceed to the appropriate section of the web site for to make your selections. Recommendations made on this web site are guidelines based on average acceptance of steering effort.